I recently completed work on a map for the Chuckanut Mountains Park District. This was a quick, fun project I did for Ken Wilcox and the other folks involved in establishing a more coherent and comprehensive land management approach for this unique region. The Chuckanut Mountains are the only place where the Cascade foothills come all the way to salt water. The map shows 2006 NRCS NAIP 1 m color orthophotography, major public land owners (derived from the Snohomish and Skagit County parcel databases), as well as all private parcels 10 acres or larger in size. I wish the CMPD well, and I hope this large poster (40" x 60") is helpful in accomplishing their mission. 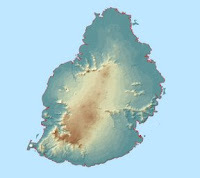 Recently, I was asked by one of my clients to project a bunch of data for the island nation of Mauritius in preparation for some wetlands-related field work they will be doing there. They received the data from the national government, and there was no projection information included with the data. 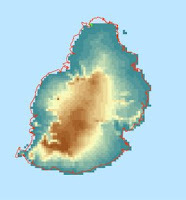 I punted on the Standard Parallels, assuming that the island is small enough for the latitude of origin to suffice for both parallels. This sort of worked, and I placed the GTOPO global DEM in the map frame with the newly projected data, resulting in the first image. Seems close, but a bit hard to tell. 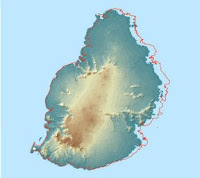 The result is a very nice agreement between the red coastline vector and the SRTM topography, shown in the third image.